Available as A5 Christmas card, postcard and mid and mini print. Ploease see order form. Red Christmas Trees. Before I moved into my new studio I worked at the kitchen table and produced a few watercolours of Perth. 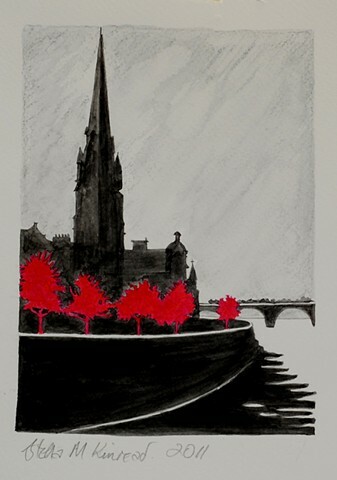 I didn't realise at the time I sketched St Matthews and Perth Bridge what an iconic view of Perth this is. However the restricted palette and the red trees appeal to more clients than I had anticipated and the black/white/red continues to be successful.